The seafood label can be misleading, he said. “We feature fresh market cuisine, locally sourced as much as possible.” The constantly changing menu includes wild game in fall and, of course, there is always fresh fish and seafood. Three favourites that always remain on the menu are seafood stuffed sole, Ahi tuna and pan roasted shell fish. Born and raised in Toronto, Bickmore has been a chef for 25 years. He became familiar with this area when he began bringing his kids to ski at Blue Mountain every March Break. About eight years ago he had the opportunity to open a restaurant in Collingwood. Catch 22 became well known throughout a wide area. “We had a great run,” he noted but he wanted to downsize and his partner, Cori, wanted to retire. The move to the Mosley Street location brought him closer to home as, he said, he’s lived in the Beach for the past five years. His entire full time staff followed him to the new location. Manager, Ashley Wray has been with him for over five years. “This is what we do and we love doing it. We have a huge passion for what we do. I work 90 hours a week because I love it,” he said. Bickmore’s two sons, Michael and Zachary are also involved in the business. “I’m the absolute luckiest guy in the world” to have my two grown sons working here. 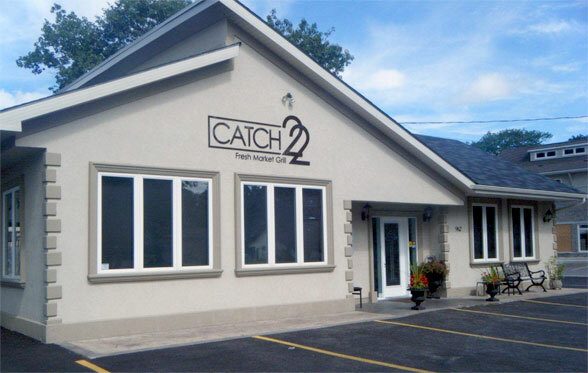 Many groups reserve seating at Catch 22. Bickmore said he had one group of 30 booked for this week. “I do groups all the time, such as Probus and other associations. One group has reserved the whole restaurant in October.” Gatherings for wine tasting and wine paring, along with beer and wine sampling are also accommodated. “The more we support locally, the better off everyone is” he said adding that, we pay more money but it makes for a greener world. Our community supports us and we want to support our community. Asked about his washroom facilities which require a step up to enter, Bickmore explained that there were many aspects of the new location to upgrade and expand and space was limited. Since the building housed a restaurant before, the lack of accessibility was grandfathered in.